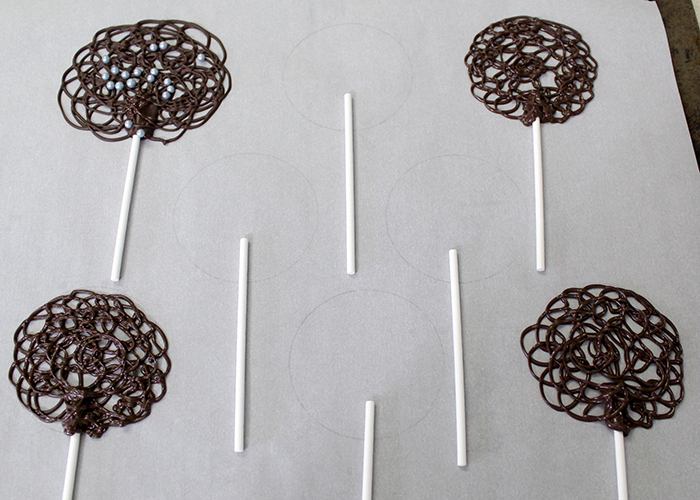 Today I’m going to share this Chocolate Lace Lollipops Tutorial! 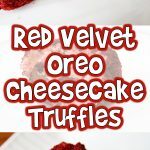 These are elegant, perfect for parties, and can be color matched to any theme. 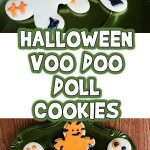 My kids absolutely love these, and I love how intricate they look! Circular object to trace. I used a juice glass. Baking sheet. To transfer parchment into the freezer. 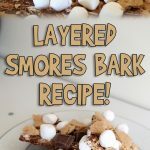 Start by laying your parchment paper wrong side up on your baking sheet. 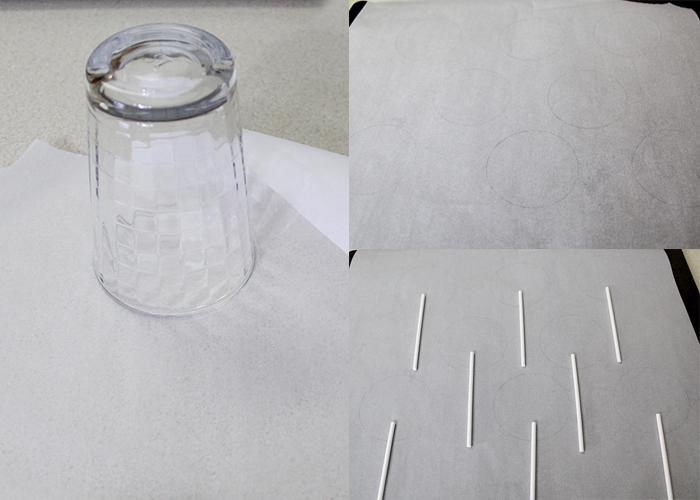 Using a juice glass or other circular object, trace circles on the paper. Leave plenty of room in between them, and stagger the rows so you have room for sticks, like shown. Flip the parchment paper over so the pencil marks are on the backside. You can still see the marks on the other side of the paper. Then lay your sticks onto the circles, leaving about an inch of stick inside the circle. 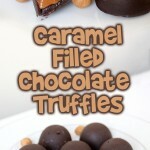 Grab your candy melts of choice, and a disposable decorating bag. 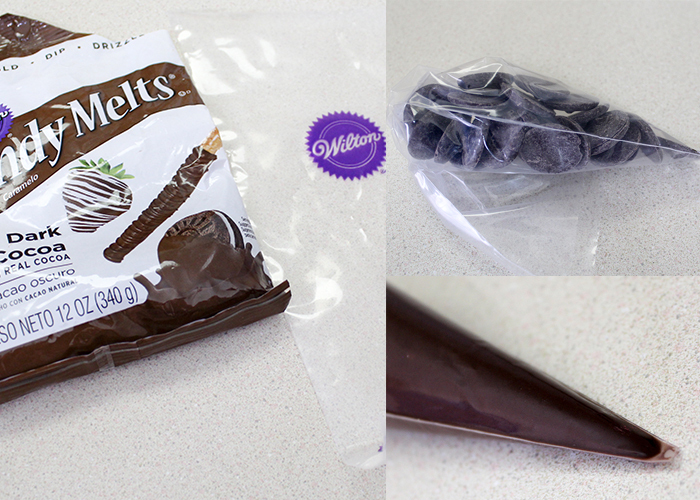 Put a handful of melts inside the bag, and twist the top shut. 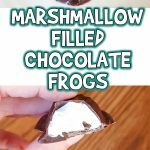 Melt in the microwave at 30 second intervals, squeezing the bag in between, until the chocolate is fully melted. Then snip the tip of the bag off. Remember, the opening at the tip of the bag is how large your lollipop swirls are going to be. 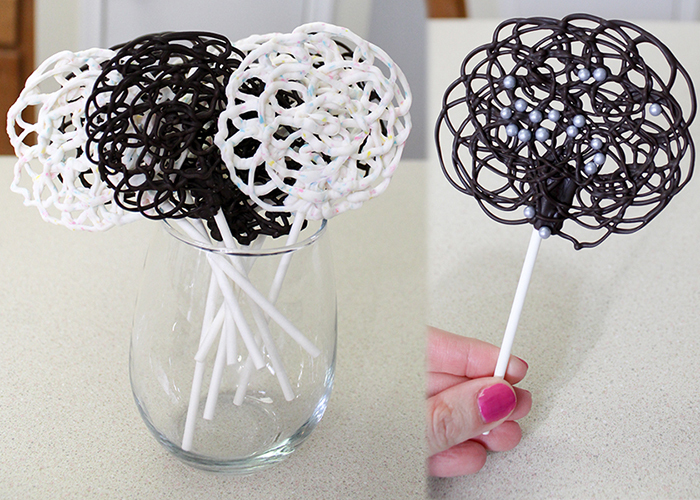 So, for a super lacy, delicate lollipop, only snip off a tiny bit. For a thicker, heavier lollipop, snip off a larger opening. Also, if your melts have any bits in them (like the confetti style I used for the white pops, or a candy cane melt) you’ll need a larger tip for the bits to pass through. 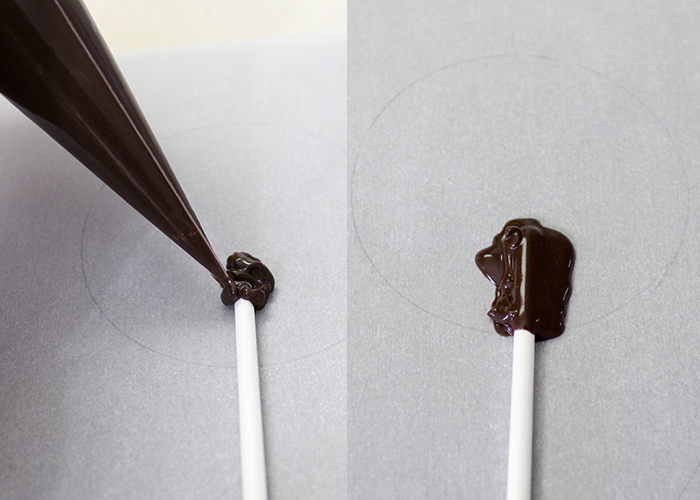 Pipe a dollop of chocolate on top of the lollipop stick, and turn the stick to coat it completely. Next, start piping swirls around the edge of your marked circle. The hand motion for this is like making a bunch of connected cursive E’s in a circle shape. Make sure to start and end at the popsicle stick. 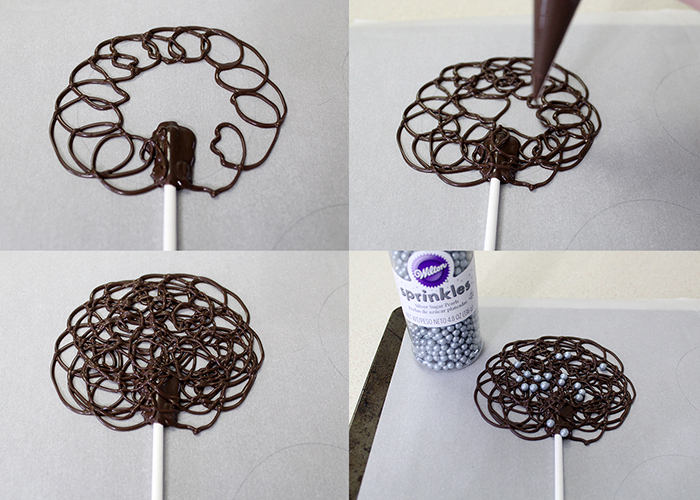 Make another row of swirls inside the first, and continue making swirls until the whole lollipop is filled with swirls. Don’t worry if your first few aren’t perfect. This is one of those things that takes practice, and looks pretty even if there are mistakes. 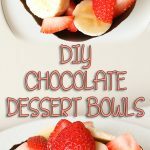 At this point, if you want sprinkles of any sort, make sure to add them while the chocolate is still wet. Go ahead and pipe the rest of your lollipops. 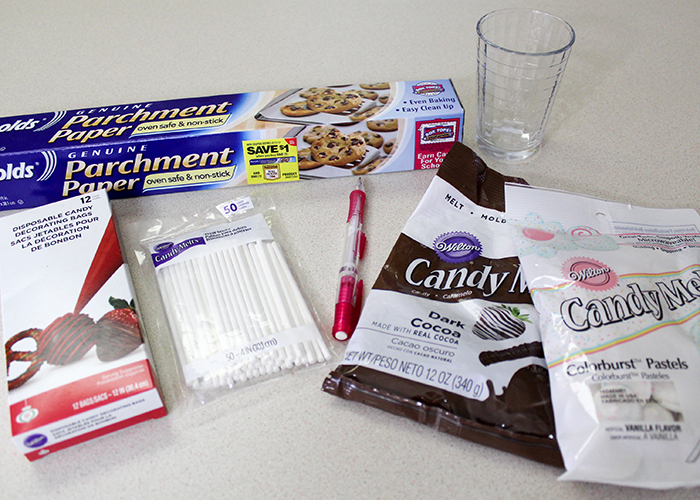 If you want to make different colors, just use a new decorating bag and different candy melts! Once you have your parchment paper full, go ahead and pop the whole tray in the freezer for about 15 minutes to set up. When they’re all firm, go ahead and lift them off the parchment paper, and you’re all done! 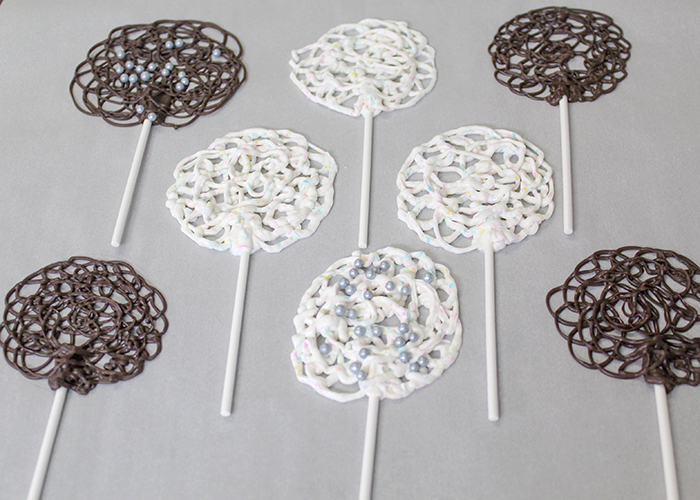 My favorite way to display these is in a pretty glass, but you can also use a cake pop display. I suggest keeping these in the fridge if you keep your house very warm, but they are fine on the counter for a few days if your house temperature is lower than 72 degrees Fahrenheit. 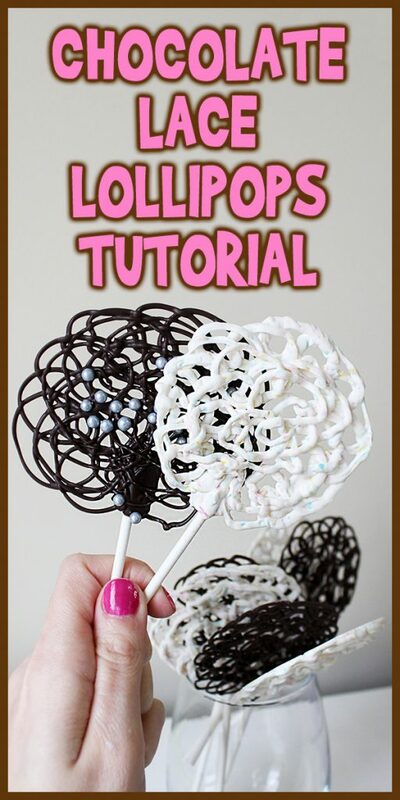 I hope you enjoyed this Chocolate Lace Lollipops Tutorial!